This forum topic is for students to self-organize study groups, etc. A covalent bond yells at an ionic bond, "Didn't anybody ever teach you how to share?" Q: What do you call a tooth in a glass of water? Julia Cheng 1B wrote: What did the thermometer say to the graduated cylinder? "You may have graduated, but I've got many degrees!" Natalie Liu 4I wrote: A neutron walks into a shop and says,"I"d like a coke." The shopkeeper serves up the coke. haha! that took me a while to understand but eventually i got it. what kind of fish is made out of two atoms? The bar tender says "We don't serve noble gasses in here." Silver walks up to Gold in a bar and says, "AU, get outta here!" What show do Cesium and Iodine love watching with one another? Have you heard the one about a chemist who was reading a book about helium? He just couldn't put it down. Why do chemists like nitrates so much? They're cheaper than day rates. Old chemists never die, they just stop reacting. A chemistry professor couldn't resist interjecting a little philosophy into a class lecture. He interrupted his discussion on balancing chemical equations, saying, "Remember, if you're not part of the solution, you're part of the precipitate!" Q: What do chemists call a benzene ring with iron atoms replacing the carbon atoms? Q: If a mole of moles were digging a mole of holes, what would you see? A: A mole of molasses. I'm all out of chemistry jokes, I should zinc of a new one. 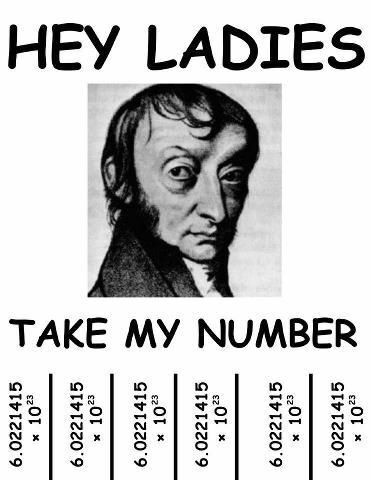 If Avogadro calls tell him to leave his number. A neutron walks into a bar and asks how much for a drink. The bartender replies, "For you, NO CHARGE." H2O is water and H2O2 is hydrogen peroxide. What is H2O4? OMG! Did you hear that Oxygen and Magnesium are a couple?! OMG! Did you hear that Magnesium and Oxygen are a couple?! How did the political science major define free radical on his chemistry exam? What do you call a joke that has cobalt, radon, and yttrium in it? If H2O is the formula for water, what is the formula for ice? Q: What is the show cesium and iodine love watching together? What kind of dogs to chemists have? Think like a proton and stay positive!! Q: What did one charged atom say to the other? A: I've got my ion you! Q: Why do chemists call helium, curium, and barium the medical elements? A: Because if you can't helium or curium, you barium! A neutron walks into a shop and says,"I"d like a coke." The shopkeeper serves up the coke. The shopkeeper replies, "For you? No charge." Q: What did the bartender say when oxygen, hydrogen, sulfur, sodium, and phosphorus walking into the bar? Q: What kind of dogs do chemists have? Q: What do you call a wheel made of iron? Q: What is the name of 007's Eskimo cousin? What do you call a fish made of two sodium atoms? Why does a hamburger have lower energy than steak? Because it's in the ground state. Did you hear about the industrialist who had a huge chloroform spill at his factory? His business went insolvent. Two chemists go into a bar. The first one says "I think I'll have an H2O." The second one says "I think I'll have an H2O too" — and he died. Q: What do you do with a sick chemist? A: If you can't helium, and you can't curium, then you might as well barium. A proton and a neutron are walking down the street. The proton says, "Wait, I dropped an electron help me look for it." The neutron says "Are you sure?" The proton replies "I'm positive." Q: What did the bartender say when oxygen, hydrogen, sulfur, sodium, and phosphorous walked into his bar? "Did you lose an electron? I'm going to keep ion on it"
an atom with a paw-sitive charge! Polar bears are really good at working together in chemistry because they create polar bonds. what is the chemical formula for a banana? all the good chemistry jokes Argon, i think we should take the bad ones and Barium. What do you do with a sick chemist? If you can't helium, and you can't curium, then you might as well barium. Not quite chem related but..
Why do many pre-med students want to donate their bodies to research after they die? Because that is the only way for them to get into med school. Why cant you drink CH2O? I know my friends don't like chemistry jokes... but I tell them periodically. Did you know that you can cool yourself to -273.15˚C and still be 0k? An ion with a paws-itive charge! Q: What did the scientist say when he found 2 isotopes of helium? Have you heard of the new element on the periodic table? Ah! the element of surprise. Q: If H20 is water, what is H204? A: Drinking, bathing, washing, swimming, etc. Q: What element is a girl's future best friend? Q: What happened to the man who was stopped for having sodium chloride and a nine-volt in his car? A: He was booked for a salt and battery. Florence Flask was getting ready for the opera. All of a sudden, she screamed: "Erlenmeyer, my joules! Somebody has stolen my joules!" The husband replied, "Calm down, honey. We'll find a solution." What was Avogrado's favorite sport? Golf because he always got a mole-in-one! Why do chemists enjoy working with ammonia? Because it's pretty basic stuff! Why aren't chemists ever able to prank their friends? What kind of fish is made out of two sodium atoms? What do chemists call a benzene ring with iron atoms replacing the carbon atoms? I slapped my neon that one!!! What do you do to a dead chemist? What is the name of 007's Eskimo cousin? What should do you do with a dead Chemist? Barium!